Two weeks ago I got a call from the University of Wisconsin Badgers . 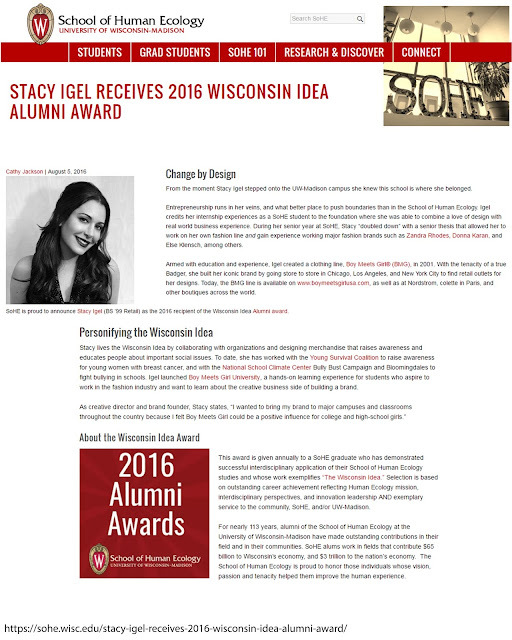 Kimberly the Associate Director of Advancement UW-Madison School of Human Ecology said, "I am calling you to let you know you have won the Wisconsin "Idea" Alumni Award." I almost fell off my seat. She said 50+ people were nominated and you were the chosen one. I sat back and I think my face turned bright red over the phone. I asked her who nominated me and she said, "I did! And I was so excited to see you WON." Kimberly had worked on this exhibit that was done on me and the brand I have built aka Boy Meets Girl last summer http://www.stacyigel.com/…/the-feeling-of-being-featured-in… at the University of Wisconsin . Sometimes when you least expect it there is an Angel rooting for you from a far. I am known to create ideas that are "out of the box" & "crushing the box". I never knew there was an award for your ideas :)) I feel like I won an Oscar lol. To be appreciated for your work truly is an honor. I get it (I mean the oscar thing lol). I never get to really stop and see what I have built but in this moment I am so grateful and proud. I worked very hard to get into UofW and to share this award with all my fellow ‪#‎BADGERS‬ is an honor. Thank you all for following my world and being incredible supporters along the way.